Collectors throughout Texas know, you always get more at Sports Cards Plus, a.k.a. The Super Hit Factory. FREE Panini Black Friday Packs with your purchase ($50 or more) of ANY Panini Product. FIRST TO PULL a Johnny Manziel Auto RC from 2014 Bowman Draft Picks & Prospects (Hobby Boxes $59.99, JUMBOS $129.99) in our store WINS $100 at Sports Cards Plus. FREE entry to our $500.00 Drawing with your every purchase of $20 or more. 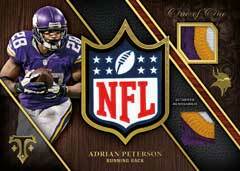 Next up (Wednesday) at The Super Hit Factory is 2014 Panini Select Football. Boxes deliver 4 Autographs or Memorabilia, 4 Rookie Cards and 4 Prizm cards. Pick your box from The BEST CASES in The Hobby for ONLY $110 per box with 1 FREE Panini Black Friday Pack. In addition, case hits include a Rookie Mojo Mini Box with exclusive Mojo Rookie Autographed Jersey Prizm Cards (#d/75), Red Mojo (#d/25), Blue Mojo (#d/15), Prime Purple Mojo (#d/5) and Tag Gold Mojo (1/1). This year's Select Football includes an "Award Section" interactive chase featuring cards honoring MVP, Super Bowl, Offensive ROY and Defensive ROY candidates. If you collect the cards of the winners, you can redeem it for a limited-edition Select Mojo Prizm Set. 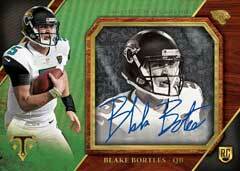 Due in Wednesday at Sports Cards Plus is 2014 Topps Triple Threads Football with 2 Autos and 2 Triple Jersey Cards per box. Topps has brought back the familiar basic design but then comes some major changes. Topps is adding 1 of 1 parallels with foil changes as well as Onyx Silver Foil, Onyx Gold Foil, Onyx Silver Rainbow Foil, Pigskin Silver Foil, Pigskin Gold Foil, Pigskin Silver Rainbow foil, Pigskin Gold Rainbow Foil and "White Whale" Printing Plates. These variations cards will also include pieces of glove, football, hats and socks. 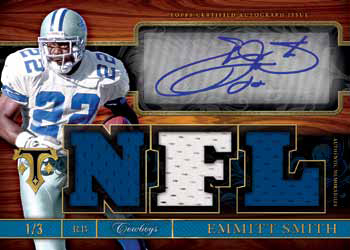 This year's case hits include Hand-Stamped Autographed Cards and Triple Threads Transparencies. The Transparencies will feature autographs on clear acetate. The 100-card base set will be numbered to 930 with seven parallels: Purple (#d 299), Emerald (#d 150), Gold (#d 99), Ruby (#d 50), Sapphire (#d 25), Onyx (1/1), and Printing Plates (1/1). James came in Saturday to give 2014 Topps Dynasty Baseball a try. Here is James with his Bryce Harper Autographed Jumbo Jersey Patch 7/10. So what are your waiting for? Don't be the guy who says, "That could have been my picture. 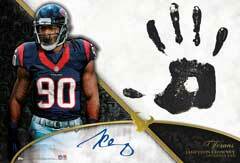 GO TO SPORTS CARDS PLUS TODAY and pull your favorite Super Hit..